The Americans TV showrunners Joe Weisberg and Joel Fields tease season five on FX. Photo by Scott Gries/FX Networks. 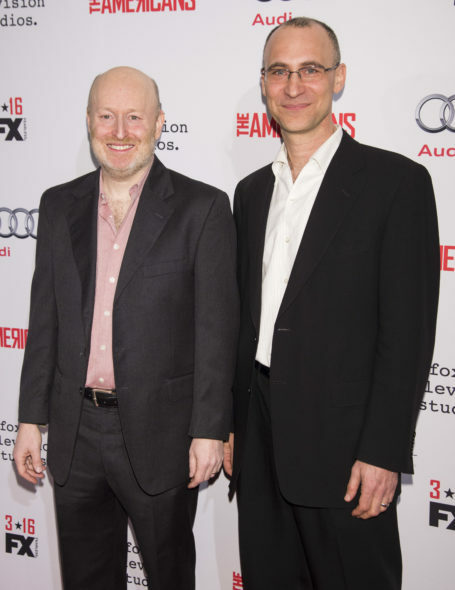 During their TCA summer 2016 presser, The Americans TV show-runners Joe Weisberg and Joel Fields dropped hints about the upcoming fifth and sixth seasons, the final chapters of the FX Cold War Spy drama. The 1980s-set series stars Matthew Rhys and Keri Russell as KGB operatives living in the US under the aliases of Philip and Elizabeth Jennings. The Americans TV series cast also includes Keidrich Sellati, Holly Taylor, Noah Emmerich, Lev Gorn, Costa Ronin, Frank Langella, Margo Martindale, and Brandon J. Dirden. WARNING: Spoilers for The Americans seasons five and six, after the jump. — Of Philip’s second wife, a former FBI secretary: “Martha is not dead, and there’s good reports from Gabriel (Frank Langella) about how she’s doing,” revealed Fields. — The Jennings’ son, Henry (Keidrich Sellati), has been kept in the dark about his parents’ spy affairs, but “he’ll become more and more part of the story,” said Fields. — “The (Soviet) recruitment of daughter Paige (Holly Taylor) will finally come to a boil,” said Weisberg. — The suspicions between the Jennings and their FBI neighbor Stan Beeman (Noah Emmerich) “get more suspicious, but in an unexpected way,” said Fields. — Philip’s son Misha, as we saw in the season 4 finale, is on his way to the U.S.
— Langella and Margo Martindale will be returning as Soviets handlers Gabriel and Claudia, respectively. Weisberg spoke about cleaning house in Season 4 with the deaths of Nina (Annet Mahendru) and FBI chief Gaad (Richard Thomas) and Martha being sent to the USSR. While it took the EPs three seasons to break these characters, the duo said today that they don’t expect any other upcoming characters to have that much weight in the Jennings’ lives. Not that there won’t be any important characters. What do you think? Have you watched the first four seasons of The Americans TV series? Do you think ending the FX show after six seasons is the right call? Tell us. I am devastated that this show will end. I grew up in the 80’s,and this show hit all the bases for what I fantasized the “Cold War” spy’s really lived. Going to really miss this well acted drama.